We are thrilled to be able to meet many of you at two different events next week – PAX West in Seattle, WA and Dragon Con in Atlanta Georgia. 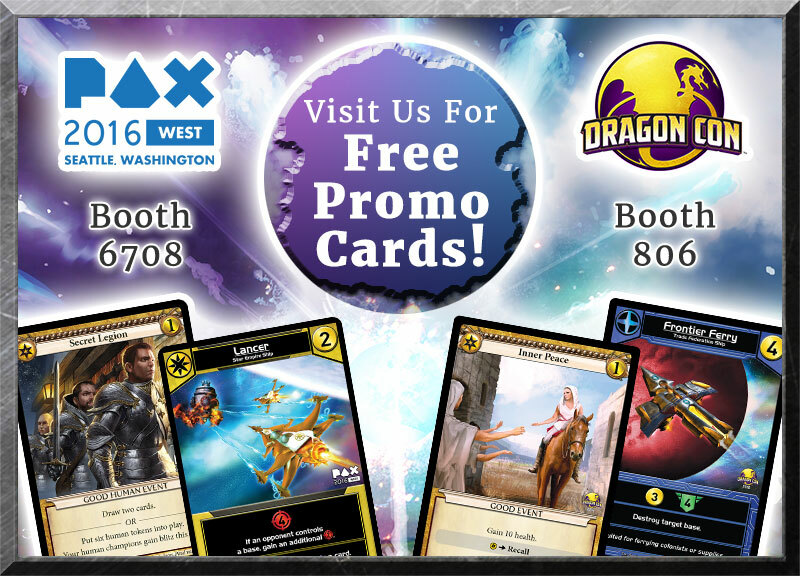 We will be giving out new Epic and Star Realms promo cards at both of these conventions, and running cool events, including Epic $100,000 World Championship Qualifers and Star Realms Legend Series events. Saturday 10:30 AM 5:00 PM EPIC Qualifier (constructed) 32 player heat, Swiss tournament run by designer Rob Dougherty. Players bring their constructed deck. Sunday 10:30 AM 3:00 PM Star Realms 64 player heat. Swiss tournament run by designer Rob Dougherty. Players don’t need to bring anything. Rule the stars! PvP single elimination tournament. Participation promo card for all players. Winner gets a prize promo & a playmat! Become a Character in the Star Realms Universe! Event open to all. Everyone gets a promo card. Playmats for top 8. Winner becomes a character in the Star Realms Universe. Winner provides photographs and one of our artists will create a card based on your likeness! Requires 8 Players to start. Become the Dragon Con 2016 Star Realms Champion! Become a Dragon Con 2016 Champion! Event open to all. Everyone gets a promo card. Playmats for top 8. Winner gets a giant 8 foot Star Realms playmat. Requires 8 Players to start. Sealed Deck PvP single elimination tournament. Participation promo card for all players. Winner gets a prize promo & a playmat! Win a slot in the $100,000 2016 Epic World Championships! Sealed Swiss, dark draft top 8. Promo cards for all, door prizes! Requires 8 players to start. We hope to see you in Seattle or Atlanta next week! Is there any way you can make the promo cards available for the online version of Star Realms?